﻿ Genetically Modified Organisms - what’s the big deal? I know that last month I said I’d be discussing the toxic nutritional belief: “If only I looked a certain way, then I’d be happy.” However, something has happened recently that has my interest piqued, and I’d like to postpone the other topic until the next newsletter. This topic is the US GMO food “labelling” bill. In July, Congress passed a bill (commonly referred to as the DARK bill) regarding the labelling of GMO foods. This has been a very big topic in the food and health industry for the past few years, as I’m sure most of you know. Now, this bill seems to be a good thing on the surface. After all, it’s a federal law requiring foods to be labelled if they include GMO products, right? Unfortunately, it’s not that simple. It allows food companies to label GMO-containing food with words, pictures, or a barcode that could be scanned by smartphones. Genetically Modified Organisms - what’s the big deal? Now some of you may be asking, does it even really matter if foods are genetically modified? The quick answer, in my opinion, is a resounding yes! I’ve done a lot of research on the subject, and hope to give you some information you might not have heard prior to now. 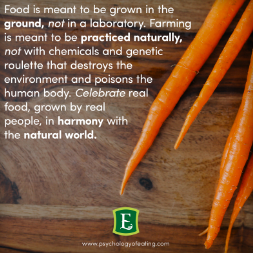 Most foods are genetically modified in order to be treated with the pesticide commonly known as Round-Up and not die. Round-Up’s active ingredient is glyphosate, which has been shown to be an endocrine-disruptor, or xenoestrogen. These xenoestrogens can also be found in BPAs (which I’m sure we all know to stay away from) and other plastics/phthalates, soy products, personal care products that include parabens, and much more. Xenoestrogens are extremely bad news. Not only are they carcinogenic, they have been shown to cause early-onset puberty. Our children don’t have the same ability as we do to detoxify, and this begins in the womb. This means that they absorb more toxins. “Experts believe rising rates of birth defects, asthma, neuro-developmental disorders and other serious diseases in U.S. children are a result of these early chemical exposures.” In the same article, it’s mentioned that pesticides are also known to put us at risk for: cancer, Parkinson's disease, miscarriage, nerve damage, birth defects, and blocking the absorption of food nutrients. ** It seems to me that we’re seeing more and more children who have ADHD, autism, anxiety, obesity, etc. What if the culprit is our food? In addition to bills like the one mentioned above, the government also tends to be unhelpful in our quest for health by subsidizing genetically modified, glyphosate-treated crops like corn, cotton (cottonseed oil) and soy. Corn, cottonseed oil and soy are in nearly everything because it’s so cheap to grow thanks to these subsidies. This, in turn, leads to processed foods that are inexpensive - another good reason to limit processed foods in your diet. Can you imagine how our food choices would change if they decided to subsidize organic foods instead? Not only do we have to worry about eating these foods directly, we also need to take into consideration that much of the meat we eat are fed these same GM foods, which is then ingested by us, meaning we might as well have eaten those GM crops ourselves. Just like it’s generally good to avoid eating too many large fish because of their high concentration of mercury, so is it good to avoid eating animals that have been fed something we ourselves wouldn’t eat. This is why grass-fed sources of meat are a healthier option. Even then, they might be “grain-finished” in order to fatten them up before being slaughtered, so don’t forget to look on the label for that information, or ask about it if buying straight from the source. I know I’ve thrown a lot of information your way, and it can be a lot to process. Hopefully you’ve found a new nugget of wisdom or two. Ultimately, the choice in food is yours. I believe that a bill that includes loopholes to labelling genetically modified organisms is wrong. We should be able to know without a doubt what we are eating -- that is a human right. I personally plan to stick with organic foods as much as possible, and to eat mostly unprocessed, whole foods like fruits and veggies. As I mentioned earlier: corn, soy, and cottonseed oil are the most commonly genetically modified crops†, so if the food you’re buying isn’t labelled one way or the other and has those ingredients, you might consider avoiding it altogether. This DARK bill still has to be approved by the President -- let’s hope he sees this wording for the loophole that it is.